Late-nineteenth-century Britain saw the privileged classes forsake society balls and gatherings to turn their considerable resources to investigating and relieving poverty. By the 1890s at least half a million women were involved in philanthropy, particularly in London. 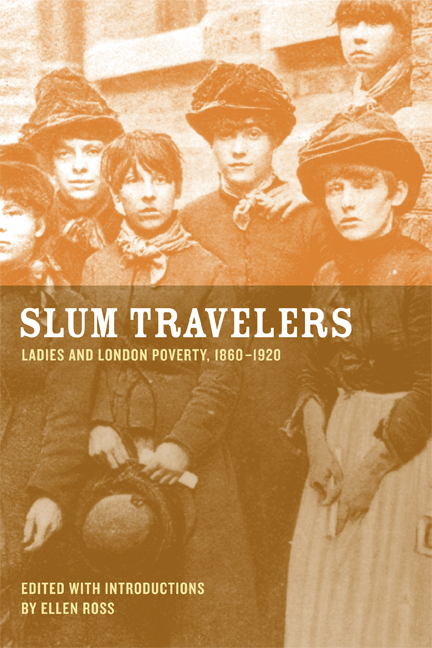 Slum Travelers, edited, annotated, and with a superb introduction by Ellen Ross, collects a fascinating array of the writings of these "lady explorers," who were active in the east, south, and central London slums from around 1870 until the end of World War I. Contributors range from the well known, including Annie Besant, Sylvia Pankhurst, and Beatrice Webb (then Potter), to the obscure. The collection reclaims an important group of writers whose representations of urban poverty have been eclipsed by better-known male authors such as Charles Dickens and Jack London. Ellen Ross is Professor of History and Women’s Studies at Ramapo College of New Jersey. She is the author of Love and Toil: Motherhood in Outcast London (1993) and many articles on London and women’s history.